Cooking is an art and a passion for many men and women. It requires great skill, dedication, and practice to prepare delicious food. If you’re preparing a meal for the first time, you’ll need guidance from your mom, co-chef or any other person you’re familiar with. If you don’t know cooking and there’s no one around to guide you, don’t worry! Simply download one of the below best recipe apps on your phone and use it. After choosing the preferred language, tap the continue button. Now, log into the Cookpad app with your Facebook, G+ account or register a new account and sign in with it. When you enter a dish name, the Cookpad app will display its recipe. It will show a list of ingredients and detailed instructions on how to mix the ingredients. The Cookpad app will also display step by step instructions on how to prepare the selected dish at home or workplace. If you have great culinary skills, you can share your recipe with other users through this app. Yummly is one of the most downloaded recipe and meal planner apps on the App Stores. It supports IOS and Android operating systems. This app has been featured on the Today Show aired on NBC. It is being used by expert chefs as well as amateur cooks. On startup, Yummly prompts users to select a taste preference and nutrition level. Once you set these two fields, Yummly will display a list of recipes. Users can add the ingredients of a recipe to the app’s inbuilt grocery list with a single click. They can sync the list between two or more mobile devices. For data syncing, the user should be logged into the Yummly app. Yummly provides filters with which you can find recipes by their cholesterol level, calories, carbohydrates, proteins, etc. 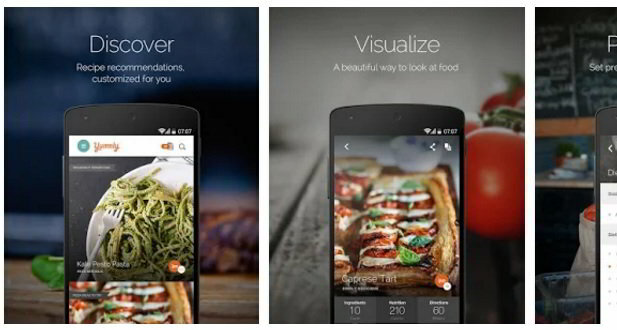 The app lets users bookmark recipes. 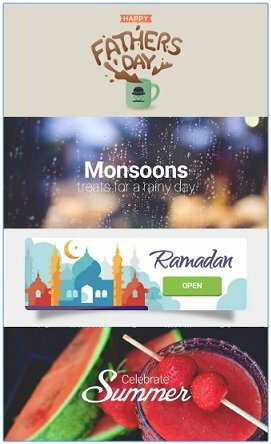 The bookmark section in Yummly is called as the Recipe box. 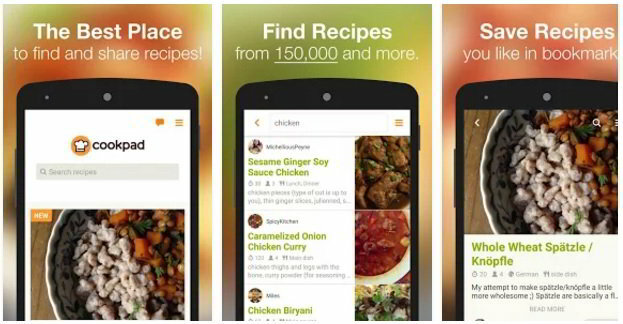 This app has a collection of 1+ million recipes from various parts of the world. It is intuitive and fast. CR is yet another popular recipe app on our list. It doesn’t require account registration. CR supports 18+ languages. To use it, the user must select a preferred language. Then, they must explore the app’s huge collection of recipes. CR enables you to find recipes which are intended to be prepared only on special occasions or a particular season. 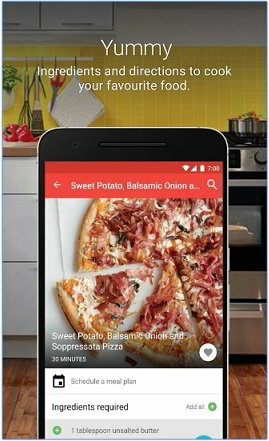 This app detects your location automatically and recommends recipes that are famous in your region. The app displays the amount of time taken to prepare a selected dish. It will also display step by step instructions to make the dish. Like Yummly, CR provides a shopping list feature. When the list of ingredients required to prepare has been displayed on the screen, users can easily add the ingredients to their digital shopping list. CR lets you bookmark recipes. It provides an option to change the default language. 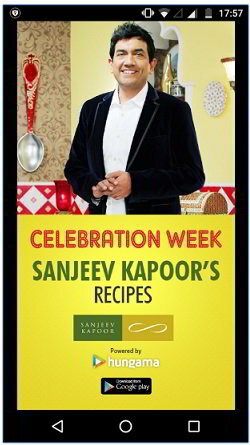 Sanjeev Kapoor is a renowned Indian chef. He has been the head chef at many top hotels. 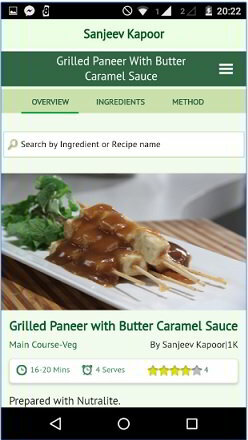 The chef had partnered with Hungama digital media to make his top recipes available in an Android and iPhone app. Recipe box: This feature allows users to bookmark a recipe. Thus, you can access recipe quickly when you’re in the kitchen. In your fridge: If you want to know what dishes you can prepare from the existing ingredients you’ve in the kitchen, use this feature. Restaurant locator: Here, you’ll find a list of top restaurants in India along with their address and location on Google Map. You can filter restaurants by their city or name. Food category, taste, cuisine, season or occasion. Tarla Dalal is yet another top Indian chef. She has been featured on some food-related TV shows and has authored several recipe books. 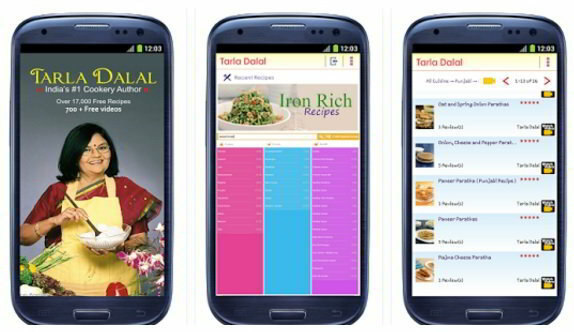 Tarla Dalal’s app allows users to filter recipes by their nutrition value, course, and cuisine. It has an option to watch Tarla Dalal’s recipe videos on YouTube. The app has special recipes for people who’re suffering from Diabetes, cholesterol and other health-related problems. Conclusion: Cooking food for the loved ones is a great feeling. If you want to make something special for your kids, husband, wife, friends or relatives, install any one of the above recipe apps on your Android tablet/mobile or the iPhone. The application will guide you in making any dish you have planned.